Our website is intended to be by the village for the village. The secondary purpose is for those who want to know about or visit our village and parish. As website designers, we see ourselves as the mechanics, translating what each community group wants into their own mini-website. So please contact us if you can represent the needs of a particular group. Eventually we would like to train someone from each group to do their own updating. In the meantime we are happy to do the updating - providing we get the information. From Clitheroe - take the A59 to Skipton. Turn left, signposted Sawley. Follow the road past The Spread Eagle pub and over the bridge. 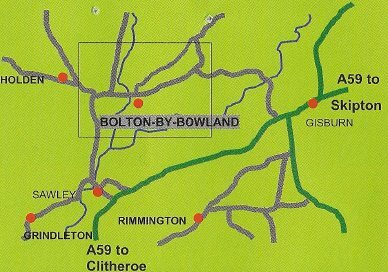 Follow the road to the right (signposted Bolton-By-Bowland) and continue for 2 miles, pas the Copy Nook Hotel and into the Village. There is a car park, information centre and rest area on your right. From Skipton - take the A59 to Preston. When you arrive in Gisburn, turn right at the Cattle Auctions and continue past Ribblesdale Park. Follow this road all the way into Bolton-By-Bowland. Continue through the village and there is a carpark, tourist information centre and rest area on the left, before you leave the village. Can you write about an aspect of the village, of the church? Can you represent the needs of one of the village community groups? Do you have any photos or history of the village? Can you take digital pictures and supply them to us? Do you want to advertise your business or services in the 'Sponsors & Services' section ?